The psychiatric morbidity in five chronic and disfiguring diseases, namely psoriasis, chronic urticaria, leprosy, vitiligo and lichen simplex chronicus (LSC) was assessed and compared using the standardized Hindi (Vernacular languages) version of General Health Questionnaire (GHQ-H). Thirty new untreated patients of each of the above skin diseases between the age group of 18-60 years were included in the study. The overall prevalence of the psychiatric morbidity was found to be 39%, depression and anxiety were present in 13% and 10.66% of the patients and suicidal ideations and somatisation in 16% and 13% of the patients respectively. Prevalence of interpersonal conflict and suicidal attempt were 10% and 2.6% respectively. On comparative analysis of psychiatric morbidity, significant difference was observed between vitiligo and other disorders (p=0.0028), i.e., chronic urticaria (p=0.0242) and psoriasis and other disorders (p=0.0028), however no significant difference could be elicited between psoriasis and leprosy or leprosy and vitiligo. Comparative analysis of anxiety revealed statistically significant difference between the patients of LSC and vitiligo (p=0.02) or vitiligo and chronic urticaria (p=0.04) but no significant difference was observed for vitiligo and leprosy of psoriasis and leprosy. The prevalence of somatic complaints showed significant difference between the patients of LSC and Leprosy. Although clinical criteria, laboratory diagnosis and treatment are well established, scanty attention has been paid to prevalence and pattern of viral warts in India. HIV is widely prevalent and its influence on the number and morphology of viral warts has not yet been studied in our setup. Hence, this study was undertaken. One hindered and forty four cases of viral warts were studied between September 2000 and June 2002 at the department of Dermatology and STD, JIPMER, Pondicherry. These included 81childeren and 63 adults. In Children, viral warts were most commonly seen in the age group of 10to14 years (41.9%), whereas in adults, the most commonly seen in the age 14to20 years (46.03%). The average age at presentation was 11.5 years. The male to female ratio was 2.2 to 1 in children and 1.8 to 1 in adults. Family history of warts was observed in 27.7% of the cases. In children, multiple site involvement (62.9%) was more common than single site involvement. The most commonly involved site was hand in children as also in adults. In adults, single site involvement (66.6%)was more common than multiple site involvement. The most common type of wart seen in both children and adults was the common wart. Twenty percent of the cases showed koebnerization. Four cases were found to be seropositive for HIV infection, who were adult with genital warts, but florid manifestations were not seen. The efficacy of podophllin and podophyllotoxin was compared in the treatment of genital warts in 72 men. Thirty five men in group A were treated with 20% podophyllin in tincture benzoin compound at weekly intervals while 37 men in group B were advised to apply0.5% podophyllotoxin solution twice a day for 3 consecutive days every week. Study period was for 6 weeks with follow up to6 months. Majority of men, 40(55.5%) were aged below 30 years. Thirty four (47.2%) were unmarried. Fifty six (77.7%) had heterosexual contact with CSws. The mean duration of genital warts was 4.8 months in group A and 5.7 months in group B. The mean number of treatment cycles was 4.8 in podophyllin group and 4.6 in podophyllotoxin group. After 6 week, 29(82.8%) men of podophyllin group and 33 (89.1%) of podophyllotoxin group were completely cured. At the end of 6 months of follow up, 8 (28.5%) men in group A and 11 (32.3%) in group B showed some evidence of recurrence of warts. Both podophyllin and podophyllotoxin were equally effective in the treatment of genital warts. However, podophyllotoxin has the advantage that it can be prescribed as a domiciliary treatment. 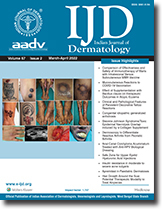 Treatment of mycetoma is always considered a challenge to the dermatologists. Hence this study was undertaken to determine the efficacy of various therapeutic regimens in actinomycotic and eumycotic mycetoma. A total of 25 patients including 18 cases of actinomycotic mycetoma and 7 cases of eumycotic mycetoma was included. Combinations of trimethoprim-sulfamethoxazole (TS) with rifampicin (regimen-3), and TS monotherapy (regimen-4) were used in 9,2,1 and 6 patients with actinomycotic mycetoma respectively. Ketoconazole (regimen-A) and itraconazole (regimen-B) were used in patients with eumycotic mycetoma along with surgical excision (in amenable cases). Remission was observed in 10 cases of actinomycotic mycetoma (eight with Welsh regimen) and one case of eumycetoma who was subjected to surgical excision followed by oral ketoconazole. Improvement was seen in 2 cases of actinomycetoma treated one each with Welsh regimen and regimen4: in 2 cases of eumycetoma treated with ketoconazole in one and itraconazole in the other. No significant adverse effect was noted in the study except ototoxicity and reaction to streptomycin in one patient. In general, therapeutic outcome was excellent in patients with actinomycotic mycetoma particularly with Welsh regimen, whereas the response to medical therapy in eumycetoma is not satisfactory. Complete surgical excision followed by antifungal therapy at an early stage for eumycotic mycetoma is perhaps the best possible therapeutic modality in the present scenario. A case of linear and whorled nevoid hypermelanosis in a 7 month old infant is reported. In addition to the cutaneous findings he also had dextrocardia, mental retardation, high arched palate, simian crease, undescended testis and craniostenosis. Acrodermatitis enteropathica is a rare hereditary disorder of zinc metabolism characterized by dermatitis involving the acral and periorificial skin, diarrhea and growth retardation. Two siblings with classical features of acrodermatitis enteropathic and an autosomal recessive pattern of inheritance are described here. A 19 year old male patient presented with a history of swelling in the right inguinal region of 2 months duration, which progressed to form chronic discharging ulcers after 1 month. Histopathological examination showed diffuse granuloma with lymphocytic infiltrate. Acid fast staining and culture findings were consistent with nocardiosis. Linear porokeratosis of Mibelli (LPM), a variant of porokeratosis, usually appears in childhood, but may occur in middle life. Unilateral lesions frequently occur and are often misdiagnosed. We herewith report a case of linear porokeratosis of Mibelli in a 4 year old girl child clinically mistaken as linear verrucous epidermal nevus. Linear lichen planus is uncommon and only occasionally has a relationship with Blaschkoâ€™s lines been observed. We describe herewith a patient who had this uncommon variant of linear lichen planus along with erosive lesion of lichen planus over the glans. Acquired nail disorders are more common than developmental anomalies. Trauma to the nail unit commonly leads to deformity or dystrophy while a split nail usually occurs as a result of division of nail matrix. An unusual case of split nail resembling a supernumerary nail is being described. A 30 year old male patient presented with erythematous plaques over trunk and extremities for last 10 years, with silvery scales. The scales on removal gave rise to multiple bleeding point. Lesions were clinically and histopathologically consistent with psoriasis. Subsequently he developed photosensitive lesions of discoid lupus erythematosus on the face for last 2 years. He had no systemic involvement or joint pain. He was being treated with emollients, topical steroid and sun protecting agent with good result. Malignant acanthosis nigricans is associated with extensive lesions and mucosal involvement. It may precede, occur simultaneously with or develop following the clinical onset of malignancy. We herewith describe a 28 year old woman with progressive generalized malignant acanthosis nigricans without any detectable malignancy or endocrinopathy.